This painting is in the "Portraits of Influence" series. Lady Diana Frances Spencer was born July 1, 1961 into British nobility and while a kindergarden teacher, she became the wife of Prince Charles. Lady Diana Frances Spencer was born July 1, 1961 into British nobility and while a Kindergarten teacher, she became the wife of Prince Charles. Diana's personal life was not a happy one; however, is credited with energizing the Royal Family's popularity. 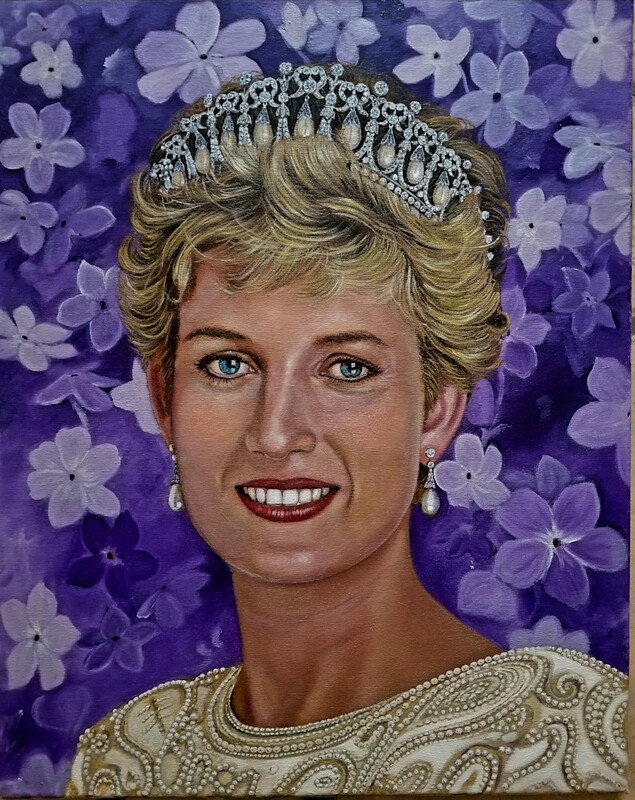 Diana was said to be more popular with the public than with the Royal family. She was noted for her compassion, fashion icon style, charisma, and high-profile charity work, as well as her ill-fated marriage to the Prince of Wales who was not able to reconcile with his wife's extraordinary popularity. The Lover's Knot Tiara Princess Diana is wearing was originally commissioned from famous court jewelers Garrard by Queen Mary sometime in 1913 or 1914. It’s actually a replica of a 200-year-old Gothic Revival tiara owned by Mary’s grandmother, Princess Augusta of Hesse, the Duchess of Cambridge. She died tragically in a traffic accident August 31, 1997.